Kitty Hawk is home to a unique mixture of classic one-story motels and upscale chain hotels that are among the newest accommodations on the OBX. Whether visitors are on the hunt for all-inclusive resorts or quaint oceanside accommodations, the selection of hotels in Kitty Hawk ensures everyone can enjoy a fantastic Outer Banks stay. Kitty Hawk Hotels can be found from the Southern Shores town borders, next to the Wright Memorial Bridge, all the way to edge of Kill Devil Hills. This locale, which is literally minutes away from the Wright Memorial Bridge, makes these hotels the easiest-to-access for visitors who are arriving to the Outer Banks from the north via US Highway 158. The Beach Road region that borders Kitty Hawk hotels and motels is sprinkled with a handful of restaurants, shops, and convenience stores. These establishments are typically within walking access for hotel guests, and are perfect for dinners out, quick lunches, or loading up on beach supplies without venturing too far away from the hotel grounds. The Shoreside Shopping center - a major shopping plaza which features a grocery store, Walmart, and a number of fast food restaurants and specialty shops - is also just a few minutes' drive away from any Kitty Hawk hotel. Watersports rentals and lessons are also located nearby, like the Promenade Watersports Center and Kitty Hawk Kayaks. Hotel patrons will also be close to a number of prime Outer Banks attractions, including the Wright Brothers Memorial, Kitty Hawk Pier, and the Avalon Fishing Pier in Kill Devil Hills. Essentially, the half dozen hotels and motels that call Kitty Hawk home may be located close to the quieter Beach Road region of the Outer Banks, but they are effortlessly close to all the amenities a family requires for a fully fun OBX vacation. Visitors who stay at a Kitty Hawk Hotel will have their choice of small beachy establishments and larger, nationally recognized hotel chains. The Outer Banks' newest grand hotel, the Hilton Garden Inn, is found in Kitty Hawk and is a popular venue for weddings, receptions, and conferences. 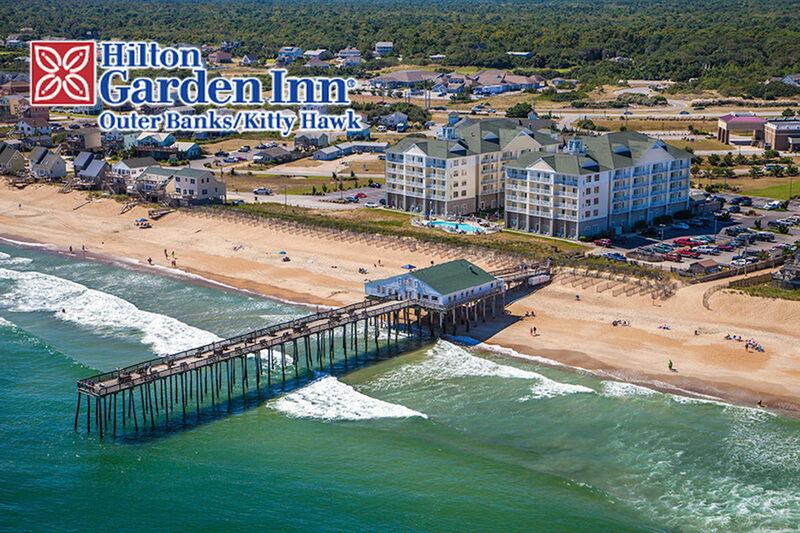 The Hilton is also home to the Kitty Hawk Pier which, though privately owned, is open to visitors when not reserved for private events. The other 5 hotels and motels along the Beach Road are noticeably smaller, but nonetheless inviting for their on-site amenities, (like pools, snack bars, and beach walkways), as well as their proximity to the oceanfront. Kitty Hawk hotels and motels are the best options for couples and small families who are planning a long weekend or short stay on the Outer Banks. Visitors will note that the rates for Kitty Hawk hotels fluctuate with the seasons. During the prime summer weeks, when the beaches are warm and all local OBX businesses are open, hotel rates are at their highest. These rates tend to drop in the shoulder spring and fall months, and are at their lowest in the wintertime. Outer Banks visitors who are planning a Kitty Hawk vacation will want to keep the following in mind when booking a Kitty Hawk hotel or motel. Larger Kitty Hawk hotels and motels have websites where guests can view rooms, peruse community amenities, and reserve their stay online. Smaller motels may have limited websites, and / or friendly staff on call who are happy to help guests reserve a room over the phone. Because there are only 6 area hotels and motels, advanced reservations are strongly encouraged. Summertime visitors, or vacationers who are planning to visit during prime holiday weekends, are encouraged to reserve their stay at least 2-3 months in advance to ensure availability. Many hotels and motels offer special amenities, like handicapped accessible first floor rooms, or pet friendly rooms. (An extra fee may be required for a pet friendly room.) Call in advance for special accommodation requests. Some hotels and motels offer discounts on off-season, weekday, or multi-day stays. Discounts may also be available for AAA members, current and retired military personnel, senior citizens and larger groups. Call in advance or review the hotel's website for more information. Because of their proximity to the beach, Kitty Hawk hotels are an excellent option for seashore fans who want to be close to the ocean, as well as the restaurants and shops along the Beach Road.